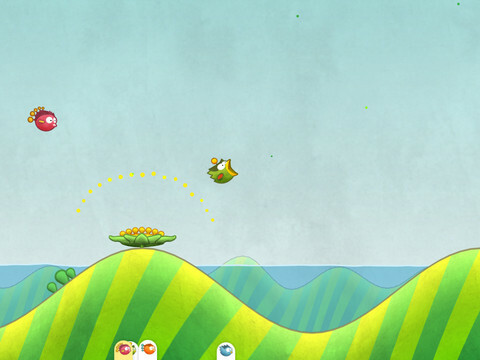 Can Andreas Illiger's new Tiny Wings reach the same heights as the original? Beware the weight of expectations. Sole developer Andreas Illiger released the original Tiny Wings last year to critical acclaim, and the game quickly came to define the independent freedom, morish simplicity, and potential for the App Store to make anyone with a dream an overnight star. Questions over his next game have raged ever since rumors of a new title began earlier this year. Would it be something completely new, or simply a sequel to the first game? The answer lies somewhere in-between the two, and has finally arrived in the form of a game that's not just a glossier version of the original, but one that also evolves the core gameplay in new and unexpected directions. In the very unlikely chance that you've yet to sample the quiet pleasures of Tiny Wings, you guide a cheery, chirpy bird across landscapes with just a press of the screen that sends it swooping through hills and valleys, collecting coins, shooting for the sky, and racing to get as far as possible before night falls. Our feathered friend is now less lonely than before! Sensibly, the core of the original game has been preserved perfectly in this new version, and it sits within the new interface as the first chapter called Day Trip. Here, you'll work through the game just as you did before, achieving objectives that might require you to reach far-flung islands before the day ends, or simply nail a target number of perfect jumps. Achieve these objectives and your nest gets upgraded along with your score multiplier. Sparkling high-resolution aside, the first real new content beyond a re-purposed interface is Flight School. Here, you choose from one of four different birds before setting off on an adventure composed of a variety of color-themed (and increasingly tricky to navigate) lands. These new landscapes throw a few neat tricks into the mix, such as flowers which launch you high into the sky whenever you land on them, or water troughs that slow you down even more drastically than those awful errant landings that everyone makes from time to time. Water troughs provide a new hazard in the game. 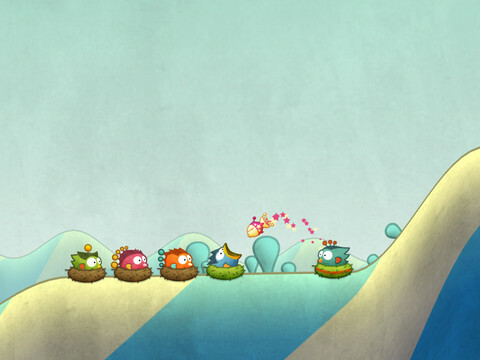 You'll also need to beat the other AI birds in this race towards the finishing line, where mother-bird waits, ready to spit a delicious fish into each arriving bird's mouth. It's all rather wonderful and evolves the simplistic charm and elegance of the original game beautifully. Hill Party rounds off the new elements of the adventure and offers the chance for two players to swoop around the game's landscapes using just one iPad. There are two different game challenges to choose from, and they both play out identically with the game split across the screen's portrait layout. Players face each other in this mirrored game area, and will either have to race to be the first to achieve 10,000 points in Island King mode, or simply earn the highest score across five islands in Five-Course Meal. 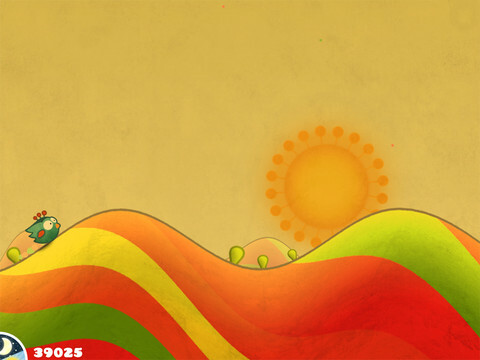 The original game has been preserved perfectly within this new Tiny Wings. With so much expectation placed at Illiger's feet, it's remarkable that this revised edition of one of mobile gaming's brightest gems not only preserves the simplistic elegance of the original, but introduces new gameplay elements that shine just as brightly. Would we have liked to have seen something completely original from the talented developer? Of course. Yet it's churlish to deny that the game has now evolved further towards perfection, and it's done so with huge consideration for the sensibilities of the original's most loyal supporters. That this new content (minus multiplayer) is also being provided completely free of charge to owners of the first iPhone version, as nothing more than a thank you from its creator, says more about the mobile gaming scene than any review ever can. What's Hot: The new game looks beautiful on the iPad, multiplayer is a welcome addition, and new gameplay elements have been introduced without imposing on the original game. What's Not: No multiplayer modes for the iPhone version.